On a visit to Israel, President Donald Trump claims to see “a rare opportunity for peace” in the Middle East, but Ali Abunimah of The Electronic Intifada says Trump is only offering more U.S. support for the Israeli occupation of Palestinians and hostility towards Iran. AARON MATE: It’s The Real News. I’m Aaron Mate. President Donald Trump continues his first foreign trip in office with a stop in Israel. Trump arrived on the first ever open direct flight to Israel from his first stop, Saudi Arabia. After landing, Trump said he sees an opportunity for peace between Israelis and Palestinians. DONALD TRUMP: We have before us a rare opportunity to bring security and stability and peace to this region and to its people, defeating terrorism and creating a future of harmony, prosperity, and peace. AARON MATE: After meeting with Israeli leaders today, Trump is set to meet with Palestinian counterpart Mahmoud Abbas in the occupied West Bank on Tuesday. Palestinians are staging a general strike today in solidarity with Palestinian prisoners in their sixth week of a hunger strike in Israeli prisons. Joining me is Ali Abuminah, co-founder of the Electronic Intifada. Ali, welcome. AARON MATE: Hi. A lot of people are remarking that it’s unusual for a sitting president to visit Israel so early into his first term, Trump arriving there just after being in office for only a few months. What’s your take on this visit by President Trump? ALI ABUNIMAH: This is part of a massive international roadshow which I’m sure that Trump is hoping will distract from his deepening domestic political crisis. The visit to Israel is, of course, part of a bigger realignment or reemphasis on aligning the United States firmly behind its client regimes in the Gulf and Israel, who are in an ever-closer alignment, and potentially escalating confrontation with Iran with possibly disastrous consequences for the region and, of course, selling unprecedented amounts of weapons into the region, which is already one of the most weaponized and heavily-armed in the world, while talking about making peace and ending violence. That’s the big context. Hard to satirize such an absurd set of circumstances and realities. AARON MATE: Can you talk about the context on the Palestinian side? Just as Trump visits Israel today, there is a general strike going on in solidarity with the hunger strike, which, as I mentioned, is now in its sixth week. You had protests today, Israeli soldiers firing bullets on Palestinians, more than 1000 people marching to a checkpoint in the West Bank. What is the context right now for what’s happening inside Palestinian society as it receives President Trump? ALI ABUNIMAH: The context is what it’s been for decades, which is a brutal Israeli grip on the Palestinian people, a deepening occupation, a deepening settler colonialism, and theft of Palestinian land. Palestinians resisting by all legitimate means, including the hunger strike. 1500 Palestinian prisoners among the 6000 Palestinian political prisoners in Israel’s jails. Now over a month of hunger strike, many of them have been transferred to hospitals in a grave condition. All of this absent from the reporting that we see in mainstream American media, which talks about Trump’s visit to Israel as if none of this is happening. The Palestinians have been, the reality that Israel is imposing on them have been almost invisible from how Trump’s visit is being portrayed. Even more absurd, you know, you have Jason Greenblatt, the negotiations envoy of Trump, who’s supposedly working to restore peace negotiations between Israelis and Palestinians, who publicly thanked Israel on Twitter for measures allegedly meant to help the Palestinian economy. Nothing could be more surreal than to claim that Israel is helping Palestinians. Israel helping Palestinians is as credible as Saudi Arabia fighting extremism and terrorism, which is another absurd message coming out of Trump’s trip. ALI ABUNIMAH: Well, that is such a typical New York Times headline. You know, it reminds me of all those headlines about Obama, killing, extrajudicial killings by drone test Obama’s principles. You know, you always see the word ‘test’ in a headline where there is just a glaring contradiction they’re trying to conceal or reconcile. In this case, of course, I mean: What deal making skills? We’ve seen Trump in office now for four months. He hasn’t been able to pass any legislation or make any significant achievements based on his promise. The other thing is is what this headline does, it plays into a narrative that has been pushed very much by U.S. media that Israel-Palestine issue is this mystical thing that just needs the right negotiator or the right skills or the right person to come along. It’s just a question of finding the magic formula. That is a narrative that obscures and erases the material realities of military occupation, settler colonialism, and apartheid. It is delusional or dishonest, and usually both, to talk about peace or reaching a peace agreement without talking about the root reasons why peace is absent, which is the fact that for decades now, 69 years, Palestinians have been dispossessed, deprived of their most basic rights. The notion that Trump can be a peace broker while doubling down on U.S. support, political, military, and economic, for Israel’s occupation apartheid, it’s just absurd. It passes without notice in the U.S. media, who talk about the U.S. as an honest broker and completely overlook because their is this bipartisan consensus that the U.S. should continue to support Israel’s occupation, apartheid, and settle colonialism to the hilt. You can have these absurd notions existing side by side. 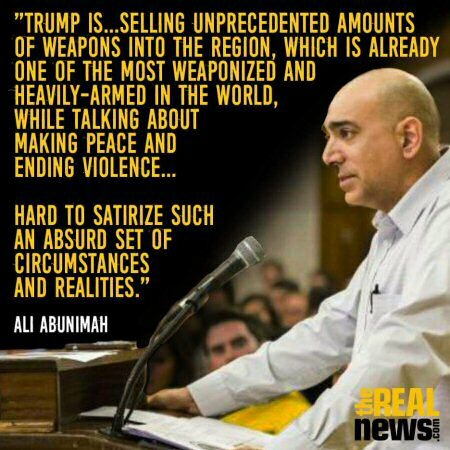 AARON MATE: Ali, on that issue of the bipartisan consensus behind U.S. policy toward Israel, in Saudi Arabia after President Trump sold all those, like arrived there and announced this massive weapon sale to Saudi Arabia, some $350 billion over 10 years, a lot of people started, on the Democratic side expressed outrage, as if saying Trump is awarding a human rights abuser, conveniently forgetting that President Obama did the same thing, sold them also I think over $100 billion in weapons. One of the people who made this criticism was Samantha Power, who was previously refusing to criticize Saudi Arabia as President Obama was arming them. I’m wondering if you can talk about that dynamic as it pertains to Israel, as well, whether for people who might say, oh, Trump is upending President Obama’s efforts to make peace with Israel and the Palestinians. How do you respond to that? ALI ABUNIMAH: Well, what’s grotesque about Samantha Powers speaking out now is that for two years, Saudi Arabia, with other gulf client states, has been bombing to smithereens Yemen, the poorest Arab country and causing one of the worst humanitarian crises in the world, more than 12 thousand civilians killed, a rapidly spreading cholera outbreak, widespread famine. Yemen has been under siege for two years by Saudi Arabian forces. All of this is utterly pointless. There’s no reason for it. It is being done with the full participation of the United States under Obama and under Trump and of course other U.S. client states like Great Britain which have been providing arms and other support to Saudi Arabia. The Democrats have absolutely no basis whatsoever to criticize Trump. It was Obama who first supported the Saudi war and it’s as grotesque for Trump to go to Saudi Arabia and sell even more weapons to this regime given the atrocities that it’s committing in Yemen and, of course, its own domestic human rights record. You know, the same goes for Israel in the sense that if we’re going to hit any criticism of Trump with regard to Israel from the Democrats, it’s going to be that he’s not pro-Israel enough and that Obama was even more pro-Israel. So far that’s true in the sense that Obama signed the memorandum that increased U.S. military aid to Israel to record levels, starting from next year it will reach $3.8 billion a year. Of course, Trump is very likely to stick to that as well. I don’t think we’ll hear Democrats criticizing it. AARON MATE: Okay. Ali, on this point, let’s stay on the issue of bipartisan consensus but apply it to Israel. It’s said that inside Israel, critics of Benjamin Netanyahu sort of more from the center, say that he’s an obstacle of the peace and we need parties like Labor in Israel who are serious about making peace with Palestinians. I want to read you a quote from Tzipi Livni, who was a former Foreign Minister of Israel known as a moderate. She recently wrote a letter to the Israeli newspaper, Haaretz, complaining about an article that was critical of Israeli government settlements. This idea that those considered the opposition are arguing that we have to keep the main settlement blocs … That’s not an issue … but we’re just against these isolated outposts. Can you comment on this? ALI ABUNIMAH: Yeah. It’s part of a giant bait and switch. Of course, you know, Tzipi Livni is presented as this so-called moderate. Let’s remember that she is, in fact, an international war crimes fugitive. Most recently, she canceled a visit to Belgium in the past few months because prosecutors in that country wanted to question her related to war crimes in Gaza in 2008-2009 when she was Foreign Minister in the Israeli government. Since then she’s become a darling of the Arab regimes. She has been on the forefront of the rapprochement or the love affair between Israel and Saudi Arabia, which is based on common enmity toward Iran and common support for extremist and jihadist groups in Syria. Livni represents the so-called labor zionists or traditional, you know she comes from the Likud, but she now represents this traditional liberal zionist view that Israel can only continue to survive with the creation of a Palestinian state. The Palestinian state that she and others like her envisage is what amounts to a Bantustan where Israel would keep the large settlements, so-called settlement blocs as you describe them, but also Livni has gone further by saying that they should actually be population exchanges where Palestinian citizens of Israel are traded for the settlements and then are stripped of their Israeli citizenship and are kind of shunted into this Palestinian Bantustan. That’s what passes now for moderation, so far to the right Israel’s political spectrum has moved. You still see people like Livni fettered in international forums. She was at the Davos gathering at the Dead Sea in Jordan in recent days, which caused outrage among the people of Jordan who object, of course, to having an Israeli official, much less a war criminal like Tzipi Livni, are welcomed with open arms as she was on Jordanian soil. It shows also the severe limits of the debate, whether it’s in this country or in Israel, about the parameters for what people call peace. It is to the total exclusion of real and fundamental Palestinian rights. AARON MATE: All right, Ali. As we end, I want to end with just some news. This is according to the Middle East Eye and it’s on the issue of Palestinian’s early negotiations. The Middle East Eye reports Palestinian Authority President Mahmoud Abbas will be presenting a plan that involves the Palestinians giving up 6.5% of their lands to Israel, three times as much as previously offered during Donald Trump’s trip. They quote a source who revealed this saying, “The Palestinian side will be presenting a new vision which is quite detached from that of the majority of the Palestinian people.” Your comment on that. ALI ABUNIMAH: I haven’t seen that report but it wouldn’t surprise me. Abbas and his entourage who, as you said, do not represent Palestinians at all have shown themselves repeatedly willing to concede fundamental Palestinian rights. They, in the past, as the Palestine papers showed in 2011, were willing to concede to Israel most of the settlements, what chief negotiator called the biggest Yerushalayim in history. Abbas himself has gone on record repeatedly saying he’s willing to give up the right of return for Palestinian refugees. Let’s remember the Palestinian authority exists because Israel allows it to exist. It continues to exist to provide a service to Israel of policing the Palestinians and reducing the cost of occupation for Israel. It is run by a very small elite who has no reason to continue to exist except for these so-called negotiations and is determined to inherit and become the ruling elite of a so-called Palestinian state at any price, including the price of sacrificing the most fundamental Palestinian rights and doing so at a time when Palestinian prisoners are hunger striking at the risk of their lives in order to protect those basic rights. AARON MATE: I’ll have to leave it there. Ali Abuminah, co-founder of the Electronic Intifada. Ali thank you.